Storey Publishing, LLC, 9781580170512, 160pp. 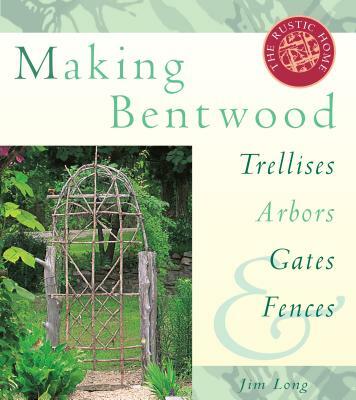 Turn discarded branches from your routine pruning into sturdy and beautiful bentwood projects for your lawn and garden. With Jim Long’s easy step-by-step instructions for creating durable fences and picturesque trellises from salvaged tree limbs, you’ll be inspired to build your own unique landscape features. Add life to your creation with one of many suggested climbing plants and watch as your structure becomes a vibrant, blooming sculpture. You’ll soon be enjoying a lazy afternoon resting in the dappled shade of your homemade bentwood arbor. Co-owner of Long Creek Herb Farm in Oak Grove, Arkansas, Jim Long is also an herbalist, author, landscape designer, and syndicated gardening columnist. His business and gardens have been featured in Gourmet, Southern Living, Better Homes & Gardens' Deck & Landscape Planner, Country Garden and many other magazines, and he has written articles for Organic Gardening, Garden Design, and The Business of Herbs, among others. His "Ozarks Gardening" syndicated column appears in newspapers in Missouri and Arkansas. Additionally, Jim has been a regular contributor for the popular "Down to Earth" column for The Herb Companion, and has taught adult education classes on herbs and writing for Southwest Missouri State University and Drury Community College. He is a member of the Herb Growers and Marketers Network, the Herb Society of America, the Garden Writers Association of America and The Author's League. Jim lives on the Missouri-Arkansas border in the heart of the Ozark Mountains. Jim has written the books Bodycare Just for Men, Making Bentwood Trellises, Arbors, Gates and Fences and Making Herbal Dream Pillows, which features the work of award-winning illustrator Dagmar Fehlau.